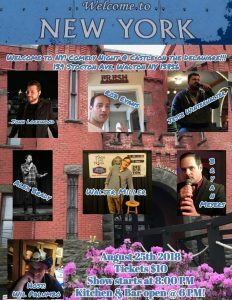 Saturday August 25th Castle on the Delaware in Walton, NY will host “New York Comedy Show” from 8pm to 11pm. Seven hilariously funny New York Comics. Delicious Food and sturdy drinks available. $10/Ticket. Don’t forget: Laughter is therapy with fun. Buy tickets from our website or at the door during the day of the event. Alex Brady is a comedian from Buffalo, NY. He has been doing stand-up for over 2 years and is a regular performer at Helium Comedy Club in Buffalo. He appears on shows throughout Western New York and Southern Ontario, and writes brief, generic bios of himself in his spare time. Bryan Myers – Raised by wolves next to a dumpster just outside buffalo New York. High school drop out with a Bachelors degree. A Veteran of the United States Marine Corps and former physical phenomenon. Bryan has been busy in his year and a half of comedy performing in showcases all across Buffalo and out in places in Olean, Jamestown, Canadaigua and Erie, PA.
Walter Miller is a stand-up comedian from Syracuse, New York that has been making people laugh since his parents took their first look at him after birth. His comedy is a throwback to the classic era of stand-up rife with one liners. Walter’s versatility runs from squeeky clean to jarring and offensive. He has been seen at the Funny Bone, The Stand NYC, Broadway Comedy Club, Helium, and is a graduate of the Hollywood, CA School of Comedy. Walter Miller was honored to have been selected to do a solo comedy show for Walmart CEO Rob Walton, and was featured on the very first television episode of Jay Leno’s Garage. Miller is, most assuredly, an act NOT to miss. Jesse R Winterhalter -live in Buffalo, NY. I’ve been doing comedy for 4 years. I have opened for touring comics including Carlos Mencia, Big Jay Oakerson, Robert Kelly, and Colin Quinn. I also host a monthly show at Helium comedy club called “The Horrible People Show”. Rob Evans has been preforming stand-up comedy since 2014 at various venues all over Northeast Pennsylvania. Inspired by one-liner comics before him such as Demetri Martin, Mitch Hedberg and Steven Wright — Rob focuses on deadpan, quick hitting, observational comedy that mostly occurs to him while daydreaming or after he’s had about 8 beers. Will Palumbo Born in Engelwood NJ, and transplanted to Gouldsboro in Pennsyltucky USA at a young age he is both a combination of city boy and redneck. Commonly known bad impersonations, and being an ear for anyone to confide in, he brings all true stories to the stage. None of what he says is fiction and has either happened to him personally, or someone close to him who maybe never asked him to keep it private; they will likely ask him to do that from now on. Currently living in Scranton, PA and mentally vacationing on Planet Zanzibar – Wil Palumbo. The deadline to purchase tickets online for "Welcome to NY! Comedy Night" on Sat, Aug 25th has passed. Tickets may still be purchased at the door for $10 each, space permitting.